Rega RX5 review | What Hi-Fi? The Rega brand has been built on four decade’s worth of class-leading turntables, and in recent years, a series of highly accomplished amplifiers. The company has made speakers for many years now, but few of these have held our attention (the recently-reviewed RX1 speakers being a good example). Sadly, the same applies to the RX5 floorstanders. That’s not down to their appearance or engineering – there’s much to admire here in both respects. To our eyes these look smart and stylish, hiding a fairly generous internal volume in a slim, but deceptively deep cabinet. The 18mm thick MDF enclosure is beautifully made, and available in walnut, cherry and black ash real wood veneer options. They’re around 84cm tall, which means they’re unlikely to look oversized, even in more modest rooms. We have no complaints when it comes to build and finish. These floorstanders have crisp edges and are made with obvious care. Rega’s engineers haven’t ignored the details as the neat cover over the front facing reflex port and the elegant integration of tweeter and mid/bass unit into the front panel shows. The company has kept things simple by sticking with a single pair of input terminals rather than going for the biwired option. That’s just fine with us, as a single run of good quality cable will always outperform twin runs of an inferior, cheaper alternative. The RX5s are a 2.5-way design with a side-firing 15.5cm bass unit augmenting the low frequency output of the mid/bass driver. The result is a pleasing amount of sonic weight and authority for speakers of this size. Getting these floorstanders to perform well in our listening room involves a little more work than usual. Those sideward firing bass drivers can work either facing towards each other or pointing outwards. In our room, inwards works best – this gives us the better balance between tonality, stereo imaging and general solidity of presentation. We also position the speakers out from the rear and side walls to avoid an excess of bass. Too close to either and the low frequencies threatens to dominate proceedings. A pair of speakers at this level should be comfortable driven from £1000 offerings such as Rega’s own (and rather excellent) Elex-R integrated amplifier all the way through to high-end pre-powers. The RX5 did just that without issue. A sensitivity of 89dB/W/m and nominal impedance of 6ohms suggests there isn’t anything out of the ordinary as far as electrical matching is concerned. Regular readers will know that Rega has been on something of a golden run in recent years. It seems that every new product, whether it’s a new Planar record player or another integrated amplifier, is greeted with a glowing five-star review from us. It’s somewhat of a surprise to find that this isn’t the case here. The RX5s are decent performers, but not as musically enjoyable as we hoped for. We start of with Michael Kiwanuka’s Cold Little Heart and the Regas respond with a crisp and organised presentation. They have a surefooted sense of timing that gives the song’s instrumental strands a solid framework to build around. These speakers sound powerful – that side-firing bass driver adding a hefty dose of authority to the proceedings. 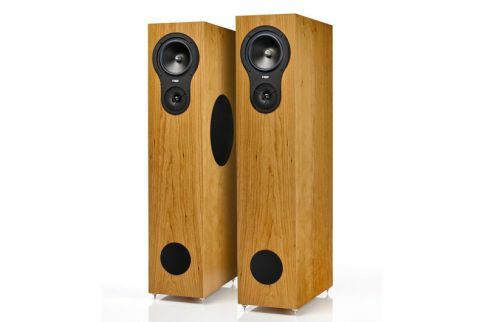 There’s also fine integration between the forward facing mid/bass unit and the tweeter leading to a focused and relatively detailed midrange performance that captures Kiwanuka’s passionate vocals pretty well. Tonally, things are even once the speakers are positioned with care. If the low-end dominates or sounds detached then you haven’t got things quite right. While capable, we’re aware that the RX5 aren’t particularly exciting speakers. They don’t quite deliver the music with the enthusiasm we expect, particularly from the midrange upwards. There’s a lack of dynamic punch and authority at mid to high frequencies that lessens the emotional impact of the music. That’s not good news at any price, let alone one at this level. This trait is also apparent with larger-scale classical pieces such as Stravinsky’s The Rite Of Spring where the RX5s fail to capture the music’s savage thrust and dynamic extremes. It all seems a little tame and lifeless for our tastes. On the plus side, the sound remains composed and suitably expansive. The stereo imaging is crisp, focused and layered and even the tonality is reasonable convincing. But we want to be caught up in the music and this these floorstanders fail to do that. We’ve reviewed two speakers from Regas RX range now, and both have fallen short when it comes to communicating the drama in music. Judged on hi-fi specifics such as details levels, stereo imaging and bass depth, the RX5s are pretty good. But judge them on the ability to bring music to life and they fall well behind the class leaders. For a Rega product that’s a surprise and a major disappointment.